A great way of involving all ages in your next Art session, these Chubby Short Handle Brushes are made for nurseries and primary schools. Using a durable, varnished wood in their design, they have been carved for ultimate comfort and fit easily within smaller hands. 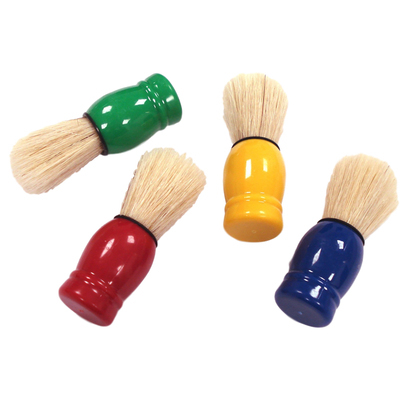 Each one has been set with a cluster of natural bristles that create a brush which picks up paint easily and allows it to be spread consistently. This set of 4 features brightly coloured handles, allowing them to be distributed around your class without arguments with a flattened base that means they can be stood up when not in use. These short handle brushes are perfect as the first tool for smaller children, help develop the creativity of your youngest pupils. Here at Gompels, we have a wide range of items available at exceptional wholesale prices including A4 White Card, A4 White Copier Paper, Gompels Assorted Ready Mixed Paint, Childrens Smock Blue, and Splash Mats Assorted.